The growth of international travel has made the global community more vulnerable to epidemics like Ebola and Zika that were once confined to unique geographic regions. The CW Network’s series Containment, adapted from Carl Joos’s 2014 Belgian television show, Cordon, is television’s latest plunge into plagues. Episode 1 presents brief glimpses of a violent “Day 13,” that forecasts what lies ahead. On “Day 1,” shortly after Atlanta Midtown Hospital’s Dr. Rita Sanders (Elyse Levesque) examines a sick, undocumented Syrian Sayid Naseer (Ronny Mathew), she and her infectious disease scientist boyfriend Henry Burns (David McKahan) fall ill and die. As the Atlanta police, FEMA, and the CDC rapidly assemble, Drs. Sabine Lommers (Claudia Black) and Victor Cannerts (George Young) deliver the bad news: “Patient Zero” (Sayid) was the victim of a highly infectious strain of “bird-flu” virus genetically modified to enable human-to-human transmission. Police Major Alex “Lex” Carnahan (David Gyasi) is given the command of the quarantine and begins to forms a cordon sanitaire around central Atlanta. The series’ subsequent action shuttles between the inside and outside of the cordon as the growing epidemic impacts several relationships: Lex and cyber-expert Jana Mayfield (Christine Marie Moses), pregnant teenager Teresa Keaton (Hanna Mangan Lawrence) and boyfriend Xander (Demetrius Bridges), and Lex’s best friend officer Jake Rile (Chris Wood) and schoolteacher Katie Frank (Kristen Gutoskie). Fanning the flames of public outrage, blogger Leo Greene (Trevor St. John) posts footage of the increasingly hazardous conditions behind the electrified fences and high walls of the containment zone. When Jake and Katie view a hospital surveillance video, they get the distinct impression of a very different start to the epidemic and the suggestion that a high-level government cover-up is under way. Inside the cordon, the rule of law is disintegrating as the body count rises. The best hope to save humanity may reside in Thomas (Donielle T. Hansley, Jr.), a small boy who appears to be immune to the virus. But, racing against time, will Dr. Cannerts discover a cure or is everyone eventually doomed? 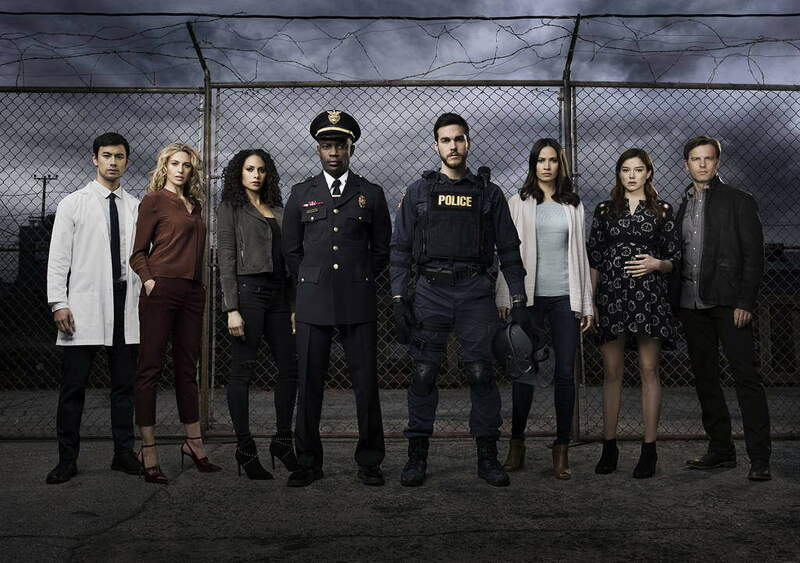 As Containment barrels on to the end of its season, there is a crescendo of crises that affects all of its principal characters and tests their inherent abilities to surmount and survive this massive medical disaster. I had great expectations for this “limited series event” (one season) 13-episode series since The CW Network had charged its adaptation to Julie Plec (The Vampire Diaries) and direction to David Nutter (The X-Files). But can today’s television audiences, benumbed by a “pandemic” of such shows, still be shocked, scared, or otherwise stirred by Containment? If coughing up blood were a 2016 Olympic event, Containment would have racked up numerous trips to the awards podium, if for no other reason than for its presentation of prodigious numbers of infected participants. But rather than amassing medals, Containment loses out to a largely pedestrian script, a glacial directorial pace, and a cast of stereotypic two-dimensional characters. Each episode attempts to follow a “can-y0u-top-this-disaster” format, but when compared to previous viral video extravaganzas like The Strain or Helix, Containment, now available on VOD, is rather lightweight stuff that fails to break much new ground or generate the excitement that its Belgian predecessor provided. Containment, now available on VOD, is rather lightweight stuff that fails to break much new ground or generate the excitement that its Belgian predecessor provided.